Apartment about 70 square meters, large living area with kitchenette, 1 bedroom, 4 pers. The apartment is located 7 km south of the exhibition center, and 12.5 km to the city center. With our good transport links you will be offered an optimal mix between nocturnal rest and proximity to the sights (5 minutes walk to the bus stop). On 70 square meters offers you a well-being oasis in which up to 4 people can leave everyday life behind. After a long day with countless impressions of the city, you can relax in the large living room on a long leather corner sofa set with a novel or a good movie (satellite TV available) or share your experiences with friends over the Internet. If you like to cook, this is child's play in our well-equipped kitchen. From the 4-plate ceramic hob over microwave and fridge with freezer to coffee maker and kettle everything is there to serve in the dining area of ​​the living room on a large oak table a magical breakfast, lunch or dinner. In the spacious bathroom with shower cubicle, bathtub, sink and toilet you will feel good. In the nostalgically designed bedroom with real walnut veneer solid wood furniture and a double bed, you will find the desired rest after an eventful day in Nuremberg. For another or two people, we can provide up to two beds in a niche of the living room on request. Meals / Shopping: Two bakers and two butchers can be reached on foot in 5 minutes. There are in three restaurants, a sports restaurant and a café. Rest / Wellness: On hot days, it is cool and relaxing in our romantic courtyard. You can also use our sun loungers under the fruit trees on the lawn in the moat. Here you will also find enough space for your morning exercise or badminton game. BBQ facilities are available. In the house there is a medical massage practice. Here, in addition to massage and heat treatment with natural moor or red light are offered. We are from the US and came to Germany for the Christmas markets. 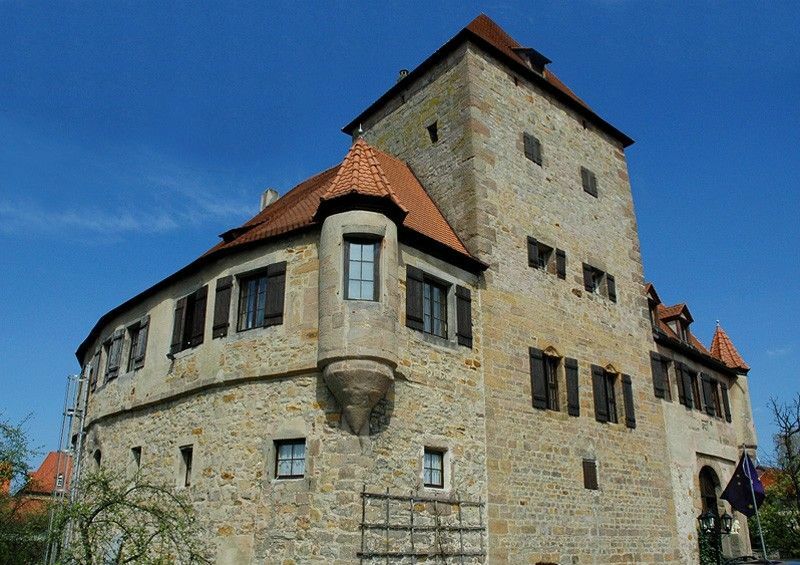 This property is outside of Nuremberg but not far. We took a taxi from the train station for $25, but every day we took the city bus - the bus stop is less than a 5 minute walk from the castle, as is a bakery, cafe and place for dinner. Aldi’s is about a 10-12 minute walk in the other direction and has everything you need. The castle itself was very safe and secure. Inside was spacious with very comfortable furniture and beds. Surprisingly, it was very warm and cozy! I thought a castle would be drafty but not at all. WiFi was strong. Ample amounts of paper products, towels, etc. Host Alfred was very helpful and kind and available during our stay. I would definitely stay again. Nuremberg is a large, very busy city and it was nice to retreat to this quiet location at the end of the day. An amazing castle with all you need. Alfred and Eva welcomed us warmly to their Schloss and we loved i! Just across the bridge over the grassed-in moat we were amazed by the beautiful inner courtyard, with a falcon family nesting in the tower! Our apartment, #4, was at the top of the outside staircase in the rounded part of the castle, so we had lots of windows all overlooking the village. The bathroom was enormous and the bedroom had a very comfortable king size bed, also lots of closet space. The kitchen was well equipped and had everything we needed. The living room had two extra beds in the corner so a family could easily have enough space. The village had several restaurants and a bakery. It was the weekend of the Karwa, the celebration of the founding of the church so the whole village turned out for a parade and festivities for 3 days, which was something we enjoyed. We were in Germany to support our daughter in the Challenge Roth Triathlon so we were just 15 minutes from Roth and Hilpolstein for the race which was very convenient. We really look forward to coming back, thank you Alfred! Herr Kraus was the perfect host. Short bus ride to the U-Bahn and into Nuremberg in no time. All this and you get to stay in a real castle! Our host was very helpful with plenty of suggestions on dining and transportation.Typical German apartment was exactly what we wanted. Really, don't stay in the city. Kornburg has everything you could possibly want. Already looking at our dates for next year! The castle has the true feel of a medieval fortress including mote, bridge ( without the water of course ) tall tower and stone walls. There are several different apartments to chose from, each with their own character and decor. We chose one on the ground floor and loved everything about the place. There is a fully stocked kitchen, with fridge, microwave, oven, stove, coffee maker, pots, pans, bowl and utensils. I like to cook and though this is not like your own kitchen but I thought most everything I needed for simple meals was available except the ingredients which I picked up at a grocery store in the next village. For simple goods, coffee, butter, bread and pastries everything is within 3 min walking distance. There are also at least three restaurants that we visited and loved within 3-5 min walking distance. The owners of the White Lamb?? ( I can't remember the name right now) are 100% friendly (they opened food service for my family when we arrived late after a full day of playing ). That gesture felt beyond kind and made them feel at home. I could go on about the friendly people in town ( every store we visited) but let's go back to the accommodations. Our room had a large living area with kitchen nook, dinning table, two single beds and a lot of vintage decorations which added to the castle feel. The modern bathroom and shower tub are located in a separate room off the entrance and are tastefully decorated with plenty of towels and hot water. The master bedroom has a television, a beautiful double bed and plenty of space to hang up clothes in the closet or just lounge on the couch. There is no air conditioning but the thick walls keep the place very comfortable. There is wifi available but due to the thick walls connection levels vary with the apartment you choose and your location in the apartment. Not a big deal ... I recommend spending more time enjoying the Court yard which is nicely decorated with flowers and/or walking around town. The owners offer laundry service for a small fee. All OUR needs were met and exceeded by the location, accommodations and the people we meet. Peter and his wife are friendly, helpful and work hard to make your stay a pleasant one. The only down side was that I had only planned for three nights at this location, next time it will be at least a week! Cozy and fun...owner was very friendly. Bus station very close by. Alfred is a wonderful host each time we stay. We are usually there for the winter and his place is never cold, always spotlessly clean, and very quiet. I can't say enough wonderful things about the place. The town is also extremely quaint and has everything you need close by. There are 2 bakeries where we share our business and an Aldi not more than a mile down the road. The restaurants there, we have frequented them all, have never stopped to impress us with outstanding food and unbelievable prices and the most gracious hosts. We have never felt like strangers in this town....definitely worth the visit. The Schloss, is the icing on the cake. Kornburg is the southernmost district of Nuremberg. Two bakers and two butchers are within walking distance in 5 minutes. There are in three restaurants, a sports restaurant and a café. Unless you want to drive your car: The bus stop is 5 minutes away. You can also reach the Nuremberg subway by bus. If you would like to bring bicycles, there is a dry adjustment. For your car parking is available. Wireless Lan and Tel. Is of course available for you. The phone charges we settle separately, the Internet is free of charge, as long as you do not go to fee-pages. We also have a guest computer in the house. The exhibition center is 7 km away. The city center is easily by bus and underground in short time accessible. Preise können sich bis zu einer verbindlichen Bestätigung ändern. Die Preise sind Komplettpreise für 2 Personen. Kinder bis 3 Jahre sind frei, sofern sie im Bett der Eltern mit schlafen. Keine Preis-Erstattung bei Stornierung.